Climate change is unlikely to affect the unique design because the design addresses the root problem. Recent modelling by ICEM for the USAID Mekong ARCC project showed that with SLR and increasing floods the maximum flood depth in an average year at the location will be up to 0.4m higher – high enough to nearly overtop the existing bank. We’ll have to come back to the My Thuan bridge in 2050 and find out if he is right. Simon Tilleard is ICEM’s Water Resources Engineer. Simon has experience in hydrological modelling and analysis, hydraulic modelling and analysis, water quality modelling, and waterway rehabilitation/erosion control design. 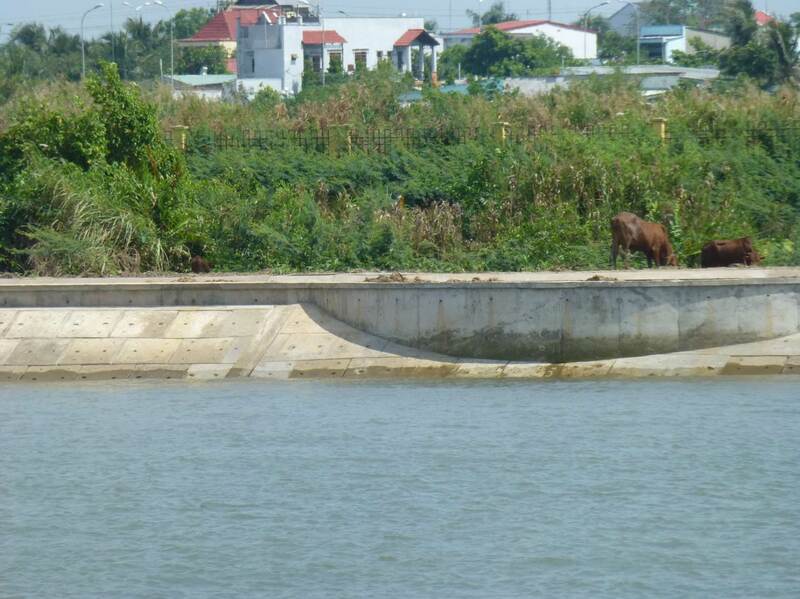 Before and after pictures of the river bank at My Thuan – from 1996 and 2013. The river bank remains at the same location as in 1996, showing the efficacy of the environmentally sensitive river bank protection method. The banks of the Mekong River erode because of natural processes land and river uses and climate change. Infrastructure and livelihoods become threatened. In 1996 erosion upstream of the bridge site was severe – but as Simon and his father verified – the erosion is now controlled at this same location. In 1996, bank retreat upstream of the bridge was up to 35 m per year before the works. The erosion control system design and construction involved 12 lines of 100 submerged piles extending 100 m out from the river bank. This slows the flow against the bank over 2 km of river. Following construction, the works were monitored by velocity measurement, satellite comparisons and diver inspections in 2002, 2003 and 2004. The water velocity measurements post construction confirmed that the groynes were successful in reducing velocity near the bank. The Tilleards’ recent observation confirms that works have successfully arrested bank retreat while maintaining “natural” bank conditions.